iPads at Clevedon – Out of the Box and Into the Learning! In June this year I was asked to go to Clevedon School near Bristol (home of the Lazy Teacher Jim Smith) to help launch their ambitious and pioneering experiment to see whether iPads, as mobile learning devices, can expand the learning of students and the creativity of teachers. The days afforded a wonderful opportunity to work across a variety of Year Groups in a range of subjects: Yr12 – Media; Yr12 – Psychology; Yr8 – Design Technology; Yr7 and Yr9 – Food Technology; Yr8 – Physical Education; Yr9 – English. The very first two periods provided a vivid illustration of how quickly the iPad can become a nimble learning device. Meeting their Media teacher, a group of Sixth Formers were provided with iPads and a short brief to create an advert for any product associated with the school. And that was it; off they went! Within the space of one and a half hours, each pair of students had come up with a finished film using the recording capabilities of iPad 2 and the iMovie app. The films were then shared, analysed, assessed, uploaded … So much learning was achieved. And quite literally, learning went on beyond the classroom: communication, selection, collaboration, critical thinking, creative thinking … all going on within the corridors, social areas, playing fields of the school … The classroom became a reflection room for the learning achieved beyond its walls! Next up, Psychology, again with Sixth Form. 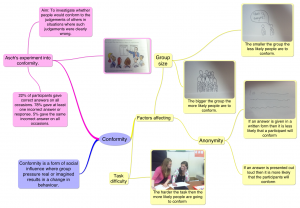 iPads were handed out and students were directed to the Mind Mapping app – iThoughtsHD. 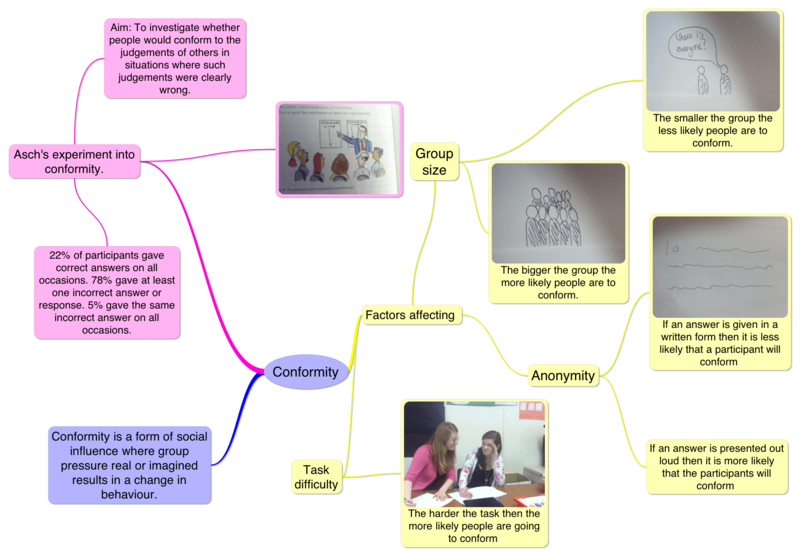 The task – familiarise yourselves with the software and then create a mindmap on ‘Conformity’ within the Social Psychology component of the course. Again, what was fascinating was how quickly the young people got to grips with the technology. Within an hour they had created quite wonderful mindmaps incorporating photographs of hand drawn illustrations, photographs of visual metaphors (downloaded or iPad taken), links to external sites of relevance. The technology was almost transparent. It was merely facilitating deep learning – not only of the psychological area under discussion, but also the associated learning and thinking skills. The second day at Clevedon saw me working with classes in Food Tech, English and PE. The day started, however, with House Dragons’ Den Yogurt Competition. In each of these learning (and social learning) contexts, the transparency and ease of use of the iPad was marked. The Food Technology class (KS3) used the same approach as the Yr8 and 9 classes the day before – capturing processes and reflections of students as they went about their baking. Again, an array of food preparation techniques was captured, students quickly getting to grips both with the recording facilities and the iMovie app for editing the clips together into short films. The PE class saw the iPads taken on to the playing fields to record the various techniques of students learning about Discus throwing. One iPad captured a variety of students participating in their learning. Again the opportunities for capture, analysis, evaluation, assessment, comment, discussion … were huge. With the English class which followed a number of iPads were distributed to allow small groups of pupils to work on their discursive writing using mind-mapping and ComicLife. Again, the teacher was able to concentrate on the learning rather than the technology; the pupils became self-directed in getting to grips quickly with unfamiliar software and then adapting it to the learning objectives set by the teacher. Pupils, although relatively low ability, were engaged and focussed throughout the lesson. So much learned; so much yet to learn. It seems clear that the possibilities for iPad integration in learning are highly significant. Not only can they, through interactive learning strategies, deepen and widen creative and critical thinking, they can also, through their ease of capture and sharing, add to a school’s vibrancy and sense of community. There are huge benefits not only in terms of student engagement but also in the cost savings in eBooks (which can themselves become highly interactive themselves …). There are also significant possibilities for eased administration and data management. The Senior Management Team at Clevedon are to be commended for taking the bull by its digital horns. Rather than endless discussions about whether and what types of mobile technologies to explore, they have seized the moment and accepted that the ways in which young people learn have broadened out to include tools that are powerful and accessible. Clevedon’s iPad initiative will not be a flash in the pan. There is a sustained commitment to interactive and assistive technologies – to educational innovation. As a corollary, there is also an ongoing commitment to staff development. Types of training might include: the iPad as a learning and teaching tool; WEB2.0 applications – screencasting, podcasting, wikis, Google docs and other collaborative tools; multimedia resources such as iMovie; Apps – uses and abuses; screen-reading applications; games-based learning (GBL) … The discovery of new modes of course delivery should breath new life and excitement into learning. Clevedon ipads ipad ICTevangelist "Mark Anderson" "David Miller"
Excellent article. As a parent I appreciate the value of the iPad to Clevedon School; I hope it gets the support it needs. Thank you for taking the time to read my blog – really interesting too to read your post following the presentations this week as well.